Nobody messes with this guy. 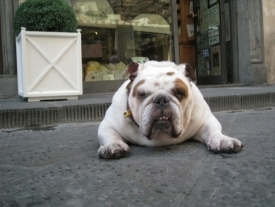 Here he is, a large bulldog with a Gucci collar, sitting in the middle of the shopping district of Florence, Italy. Not only was he totally at ease with tourists taking his picture, he seemed to like it. What a life.